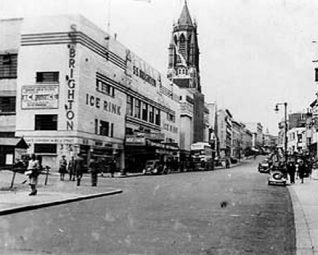 Photograph of the S.S. Brighton swimming stadium in West Street in 1934 before its conversion to an ice-rink. It was opened by Earl Howe and one of the first people to dive from the high board was Johnnie Weismuller of "Tarzan" fame. 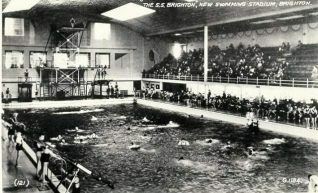 e) SPORTS STADIUM or S.S.BRIGHTON: This popular centre was opened by Commodore Earl Howe on 29 June 1934 as the S.S. Brighton swimming-pool, a square building faced with cream tiles which was erected at the corner of Russell Road on the site of many small tenements and other buildings at a cost of £80,000. The interior was decorated in the style of an ocean liner (hence S.S.) and housed the largest covered sea-water swimming-pool in the world, 165 feet long by 60 feet wide. 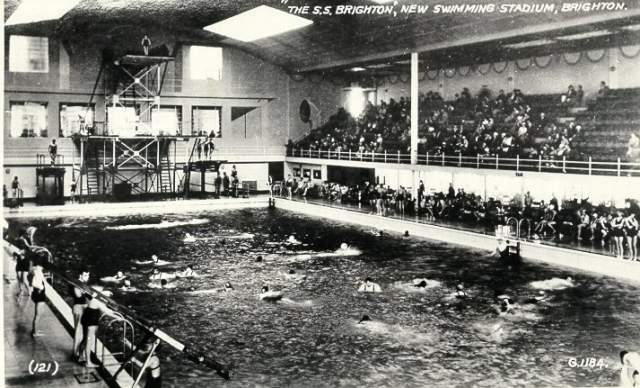 Swimming championships and bathing-beauty contests were held, but after only one year the pool was converted into an ice-skating rink, reopening on 16 October 1935 as the Brighton Sports Stadium but still also known as S.S. Brighton. The first of the many ice-shows opened on New Year’s Eve 1936 and was followed in the summer by a sensational show called Marina. 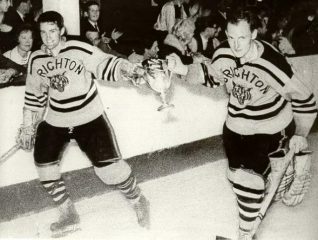 After the war many other attractions were staged including judo, wrestling, basketball and professional tennis, but in September 1959 the stadium was relaunched as the Brighton Palladium, staging Sunday variety shows, musical concerts and party political conferences as well as sporting events. After a takeover by Top Rank in February 1962 though, the building reverted to its original name.